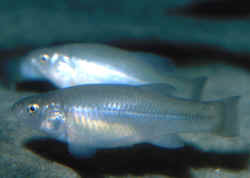 Cyprinodon macularius Baird & Girard 1853, the Desert Pupfish. Southwestern N. America into northern Mexico. pH range: 7.5 - 8.0; dH range: 13 - 19 To a maximum length of about five cm.s. 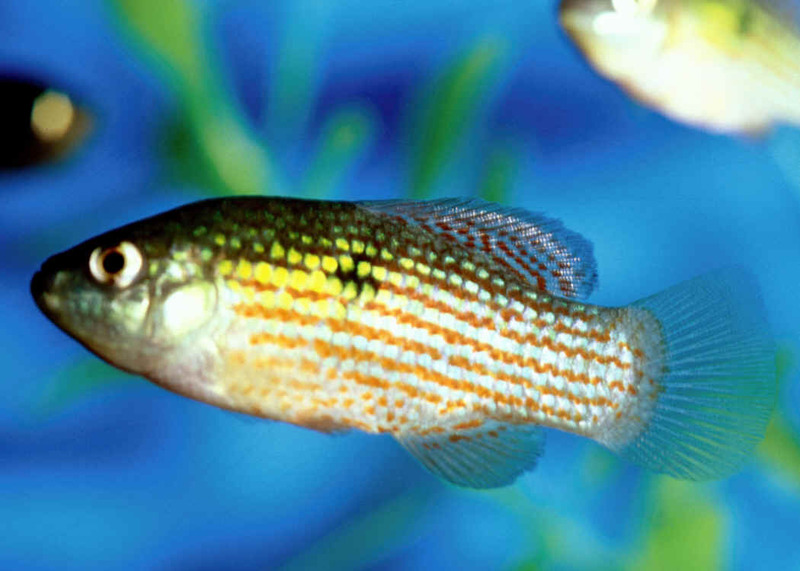 Fundulus parvipinnis Girard 1854, the California Killifish. Eastern Pacific; The two Californias, Mexico and U.S. To a maximum length of about four inches. Hard to keep in captivity. Brackish to marine. Birch Aquarium image. Jordanella floridae Goode & Bean 1879, the (Florida) Flagfish. To two and a half inches. Record of least number of eggs produced for an egglaying fish species (about twenty, laid over a period of days). Originally found in the St. Johns and Ochlocknee Rivers and drainages of Florida. Aquarium photo.